So.. I modified it and wrote it up so a person like me can cook it. I measured it in ways that make sense to men. So if you're the kind of person who wants to know how you cook cube steak in a crock pot without worrying about whether your you'll need to be able to parch something.. then try this. Some cube steaks you bought and froze because they were on sale and cheap. Some water. It doesn't have to be bottled. It just has to be wet. Some little cubes of powdered beef. Beef bull-onions or something like that. Some onions. If they have tops growing out of them... just cut that off. They are still good. Wash the cubed steak and put it in a bowl. Plastic, tin, ceramic... it don't matter. It's just a bowl. Pour the mushroom soup in the bottom of the crock pot. Then fill up the can with water and swoosh it around, or use a spoon to get that stuff on the side of the can, then pour it into the crock pot. Sprinkle some garlic salt and pepper on the cubed steaks that are on the top in the bowl, and put the steaks with the side you seasoned face down on the bottom of the crock pot and on top of the mushroom souip. Sprinkle the cubed steaks in the crock pot with garlic salt and pepper then put sliced onion on top of them. You want the onions in there so that the steaks won't stick together while they are cooking. 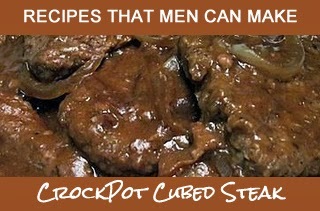 Repeat steps 4 - 6 until you have all the cubed steaks in the Crock pot. Wash some carrots and put them on top of the whole getup. Go hit some balls at the driving range. Surf the Internet for the phrase "Watch this!" Watch your kids cut the grass, wash the car, clean the garage or anything else you need them to do. Talk to your wife or girlfriend about stuff they like. That way you won't have to do it during the game or during Star Trek, Die Hard, Terminator, or the Matrix. Or you can just watch a game on tv, and move to step 8 at half time. Put it on a plate and eat it. Put the crock pot in the sink so your girlfriend/wife can clean it. After all...you talked to her for an hour earlier in the day. It's the least she can do. Notes: You don't have to use garlic salt and pepper. You can put barbeque sauce and beer in it if you want to. Salsa, chili pepper and cayenne if you want. It won't matter. If you let it cook long enough, the smell gets all over your house, and nobody will complain about it anyway.